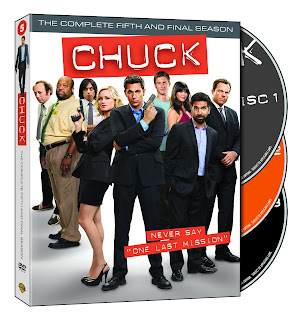 A Borderline Mom: Chuck: The Complete Fifth and Final Season is Available NOW on DVD and Blu-ray!!! Chuck: The Complete Fifth and Final Season is Available NOW on DVD and Blu-ray!!! In the season finale of Chuck, Sarah and our good hearted hero find themselves sitting on a beach side by side. The married couple reminisces and share one final kiss as the scene fades. Do you think her memories were starting to come back? Did that ‘one magical kiss’ succeed in kick starting Sarah’s memories? I'm pretty jaded when it comes to romance, especially romance on tv's and movies. So, I don't know as though I believe that the kiss sparked her memories so much as maybe she felt some kind of connection with Chuck that made her want to kiss him and feel close. In instances like this, sure her short term memory could come back, but I'm thinking at this moment in the finale, they didn't. What do you think?